A diamond anniversary ring with a pave setting can be a beautiful piece of jewelry to symbolize an ongoing commitment to a spouse or partner. Pave settings are elegant and luxurious, and there are many pave anniversary ring designs available that can be worn alone or paired with a wedding ring or bridal set for even more bling. Click on any of the following ring photos for retail information. A gently domed ring with an even pave setting is the best way to add maximum sparkle to your finger. These designs come in a variety of widths and the sizes of the diamonds used to coat the ring can also vary to give it different textures. The contrast between blue and white diamonds set in this twist pave band is sophisticated and chic. This is a great way to add a ring to a bridal set without overwhelming the engagement and wedding rings. Men's pave setting rings are typically broader than women's rings and will include several rows of stones for the complete pave look. 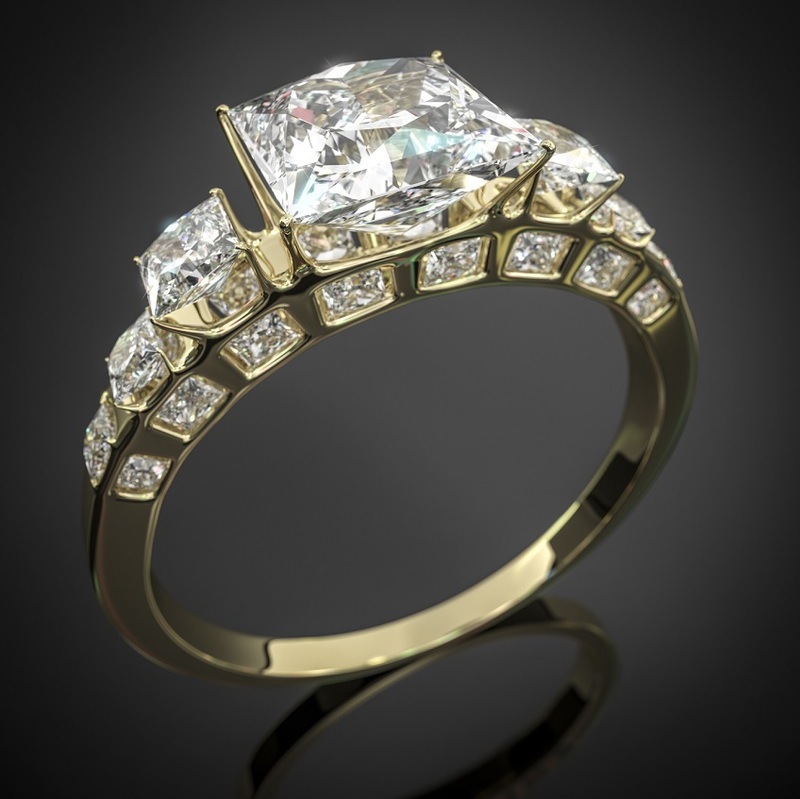 A concave ring shape gives this design even more distinction. While round cut diamonds are the most popular for a diamond anniversary ring with a pave setting, a woman who wants jewelry with a more distinctive look may opt for a pave diamond ring that features both round stones and baguettes for visual texture and interest. Three stone diamond rings are popular anniversary designs because they represent the couple's past, present, and future - perfect symbolism for celebrating an anniversary. Pave settings on the ring's band add extra glitter to the trio of symbolic stones, and multiple rows of stones can be added to a three stone ring without overwhelming it. Two tone pave diamond rings have a rich luster and magnificent color that highlights the extraordinary diamond setting. The interlocking swirls is subtly reminiscent of intertwined your intertwined lives, making it perfect for an anniversary ring. Micro pave rings often use very small diamonds or diamond chips for a delicate, intricate pave setting perfect for a thin ring or petite fingers. This is also a great anniversary ring to combine with a simple wedding ring without overwhelming it. While white gold and platinum are the most popular precious metals for pave diamond rings. However, colored metals are increasingly popular because they show off the amazing arrangement of diamonds more clearly. Tinted gold such as black, rose, or chocolate is popular for this type of design, and the criss-cross design on the ring's band gives it even more flair. Eternity bands with a single circlet of stones are the most familiar and most popular style of diamond anniversary rings. While channel settings are most popular for eternity or infinity rings, a pave setting gives the ring a more delicate look and a touch of uniqueness for a chic and discerning style. A diamond anniversary ring with a pave setting does not have to be a simple band that will pair with a wedding ring or bridal set. A pave set band with scattered accents or other design with bold curves and texture is a great option for a bold anniversary statement. There is no more romantic anniversary ring design than two hearts, and hearts with pave set diamonds are a great choice for a glittering piece of jewelry. Colored diamonds or other semi-precious gemstones can also be used to make the ring more unique.